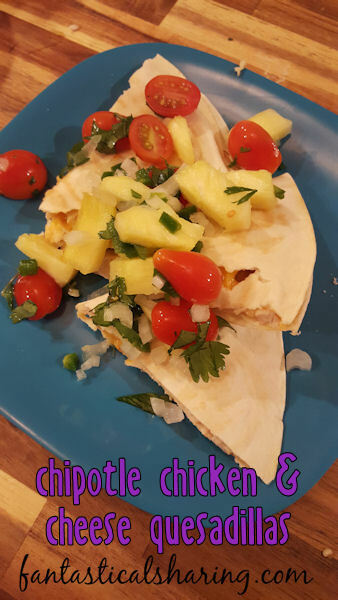 Very simple quesadillas with creamy chipotle cheese and topped with pineapple pico de gallo. If I choose to make a recipe, it's typically based on a picture. Much like how I am a cover judger with books...I'm a picture judger with recipes. I don't do this 100% of the time - lots of times I pick from just text recipes with no pictures because it sounds appealing. Because I choose things that look appealing..I go in with about the same expectations for all the recipes. I expect them to be good and that I'll like them. Sometimes we have recipe flops (either because of this gal's human error --or just something we didn't care for)...and lots of times, recipes blow me away with how darn good they are! This was a recipe that totally took me by surprise. 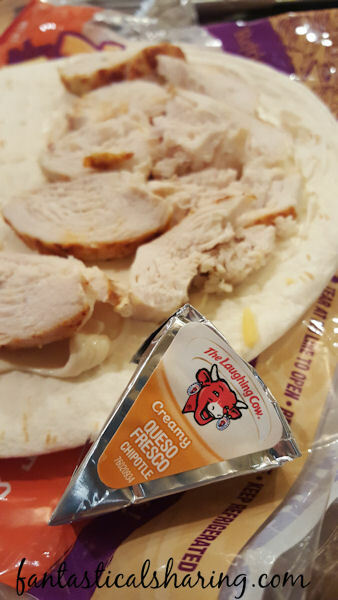 I expected it to be good - what's not to like about a chicken and cheese quesadilla?! But I highly underestimated the Laughing Cow Queso Fresco Chipotle cheese. Like a lot. The creaminess added the best best best texture to these quesadillas. I added a little shredded cheese on top of the chicken because I love cheese. 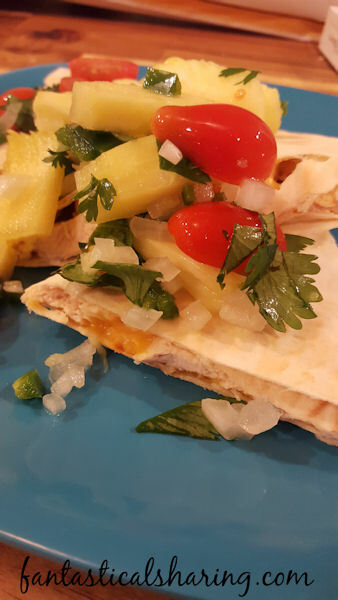 What really takes the cake is this delicious quesadilla TOPPED WITH the incredible Pineapple Pico de Gallo (I posted the recipe yesterday). Altogether, it's easily my favorite quesadilla of all time and it's easy to make it. Doesn't take much effort at all! Slice chicken into two thin breasts each. Season with taco seasoning and cook on a grill or cook in a skillet. Let rest for about 5 minutes before slicing into strips. Spread a wedge or two on one side of a tortilla. Then place chicken on top. Sprinkle a little cheddar cheese on top and fold in half. Spray the top with nonstick cooking spray and place in a nonstick skillet, coated side down. Spray the top of the tortilla. Cook until both sides are golden brown. Repeat to make as many as you need. I believe I made 6 or 7 with some cheese and chicken leftover. Slice each quesadilla with a pizza cutter and serve topped with pico de gallo.